It’s that time of year in France when people of all shapes and sizes don a fluorescent yellow jacket with a ridiculous hat, and walk around toting guns. Yes, it’s hunting season again, when the peace of the Bournac countryside is shattered by the crack of rifle shots, the baying of dogs and the thought that any minute I might get a bullet in the back of my head. You then have to do a practical test where you simulate hunting (cut away to Marcel Marceau miming how to chop up a wild boar), shoot at coloured targets (some of which are permitted targets and some not) and then shoot a moving target (hopefully, not the person you have surprised in the undergrowth who is now running for their life). But hunting is said to be the second most popular pastime in France after football. It’s part of national culture and we have to live with it – we are after all guests in France (imho). So in hunting season, where can you tool up? 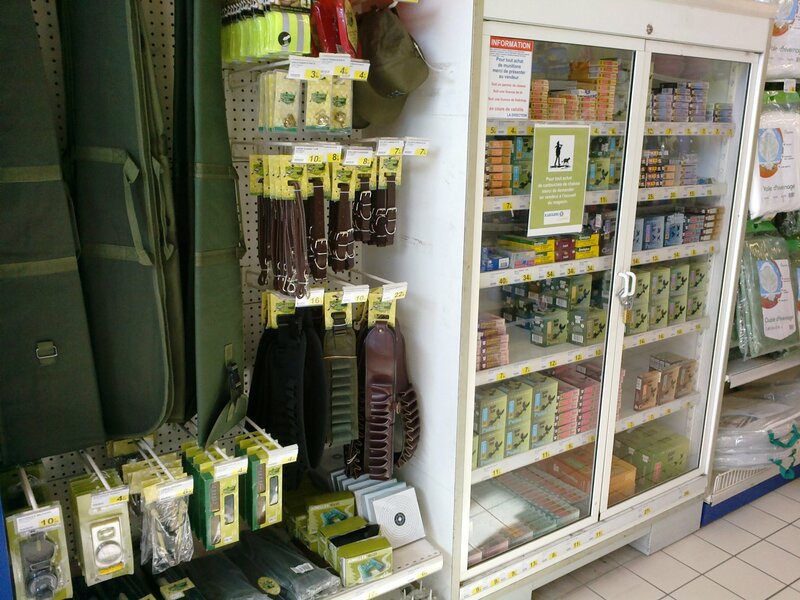 There are of course hunting, shooting and fishing shops on high streets, but why not satisfy all of your ammunition and webbing needs while you do your weekly shop? Yes, the local supermarket can supply you with bullets and targets while you pick up your Oranginas and camembert. In fact, a radio advert told us there was 30% all weapons and ammunition at a local shop for a limited period only. The French think we’re off our rockers. Categories: Country life | Tags: France, French country life, hunting season, Midi-Pyrénées, Rural life, Tarn, Wildlife | Permalink.